One of the newest cholesterol-lowering drugs should be removed from the market because of safety concerns, an expert has said. Dr Sidney Wolfe from US consumer group Public Citizen says the statin Crestor (rosuvastatin) carries a higher risk of side effects than other statins. Writing in the Lancet, he says the risk of muscle wastage and kidney failure means the other statins should be used. 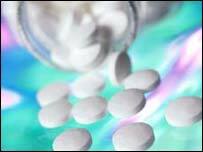 Manufacturer AstraZeneca says Crestor is as safe as other statins. Statin medicines have been available in the UK for the last 14 years. There are five different types available, including rosuvastatin, licensed for use in the UK by the government's Medicines and Healthcare products Regulatory Agency. All statins work to lower cholesterol which, in turn, reduces the risk of cardiovascular disease - the biggest cause of death in the UK. Rosuvastatin was launched last year in the UK and about 110,000 patients had received the drug by March 2004. In May this year, rosuvastatin's manufacturer AstraZeneca sent a letter to doctors reminding them to reserve the highest doses for patients at highest risk of heart disease because of safety concerns. The concern was about the drug's link with a condition called rhabdomyolysis - a muscle wasting condition that can lead to kidney damage and failure. Other statins also carry a risk of rhabdomyolysis and kidney failure, which is dose related. The government's Committee on Safety of Medicines monitors these side effects. It says about one case report of rhabdomyolysis has been received for every 100,000 patients, for each year of treatment with any statin. A detailed analysis by the CSM and MHRA of the safety information for rosuvastatin at the end of its first year suggested that although the top (40mg) dose benefits a small percentage of patients, it may be associated with a higher rate of side effects, including rhabdomyolysis. The CSM received six reports of suspected rhabdomyolysis associated with rosuvastatin. Five of these were receiving the maximum 40mg dose. But Dr Sidney Wolfe is worried that even the lowest dose, 10mg, carries too high a risk. He says the US has seen 20 cases of rhabdomyolysis and kidney failure in people taking 10mg of the drug. "The renal toxicity, high rate of cases of rhabdomyolysis compared with other statins, and lack of unique benefit are compelling reasons to remove rosuvastatin from the market before additional patients are injured or killed," he says in his letter. Dr Jim Kennedy, prescribing spokesperson for the Royal College of General Practitioners, said: "The reported incidents of the side effects of rhabdomyolysis and kidney damage with this drug are of concern and we need a clear assessment and advice from the licensing authorities [such as the CSM] on the safety and efficacy of this drug." The CSM said: "As with other new medicines, the safety of rosuvastatin will continue to be closely monitored by the Medicines and Healthcare products Regulatory Agency and CSM. "Should any new information or concerns regarding the safety of rosuvastatin emerge, the CSM and MHRA would take all necessary regulatory action. AstraZeneca said Dr Wolfe's claims were "misleading" and based on inappropriate interpretation of data. Dr Neil Brickel, the company's UK physician for Crestor, said Dr Wolfe had failed to look compare the number of cases with side effects with the rate of the drug used. "The rate of side effects with Crestor is completely in line with other statins. Ten milligrams has been associated with some cases of rhabdomyolysis, but so has 10mg of the other statins as well. "We are talking about a very rare side effect. The benefit-risk profile of Crestor is far in favour of benefit," he said. The warning intensifies doctor's concerns about patients soon being allowed to buy statins at pharmacies "over-the-counter" without the need of a prescription. The British Medical Association is concerned about the safety and efficacy of statins being available over-the-counter. From next month, another type of statin, simvastatin will be available over-the-counter as well as on prescription. Dr John Chisholm, chairman of the BMA's General Practitioners Committee, said: "We are concerned that there won't have been a sufficiently thorough risk assessment before the drug is purchased. "There are concerns about the risks of treatment as there are potential side-effects with all statins. Patients taking statins should be monitored on a regular basis to assess the effectiveness of the treatment."